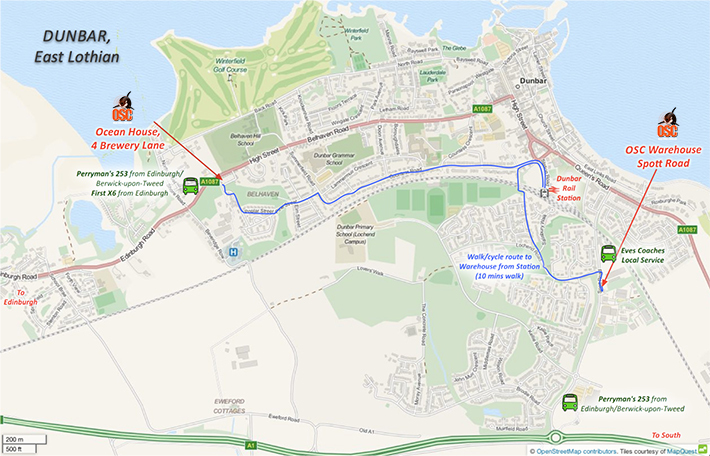 Spott Road is busy with traffic and the pavement is narrow, so visitors from Dunbar are advised to use the walking route marked on the map above. Trains run to and from Edinburgh approximately every hour during the day. Visit www.thetrainline.com or call 08457 48 49 50 for timetables. The walk from the station takes about 10 minutes. Coming out of the station walk to the top of Station Road, then turn left and left again to cross under the railway line. Turn left after the tunnel and follow the path till you get to Lochend Road where you turn left. At the T-junction with Spott Road, cross over to the entrance road for Ocean Science Consulting. By car, leave the A1 for Dunbar at the Spott roundabout and continue for 600m on Spott Road. Turn right. Parking is available on site. It is not necessary to bring your own car as Dunbar has a car club for short term hires. Visit www.sparewheels.org for further details.